Any parent or caregiver knows that kids ask some tough questions. And while we now often have tiny computers at our fingertips, being able to sit down and work through answers that are at once satisfying and age-appropriate feels so much better. For questions about our beginnings and the origins of this marvelous blue marble we live on, there’s a beautiful new picture book that provides answers with age-appropriate truth and imagery. 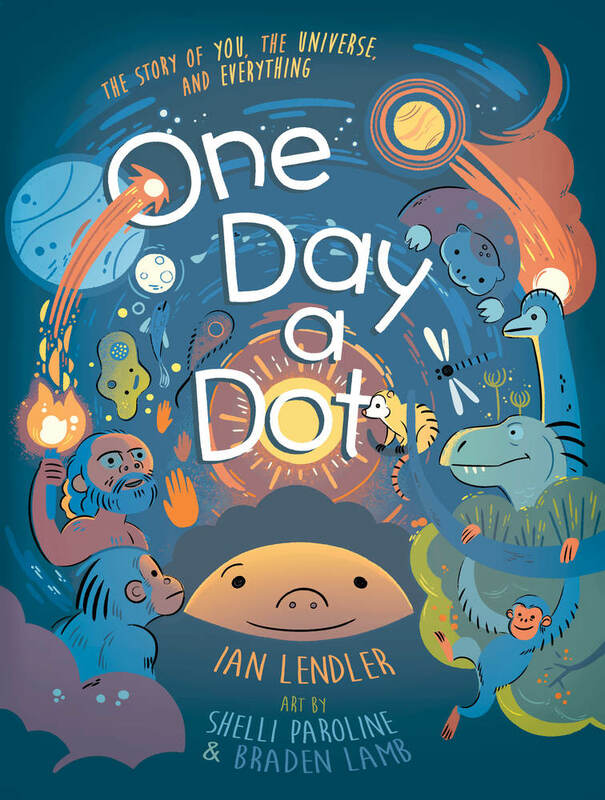 One Day a Dot by Ian Lendler, illustrated by Shelli Paroline and Braden Lamb, takes readers from the Big Bang to modern day self-awareness and a child’s curiosity. This book is recommended for children ages 4-8, but slightly younger and older could absolutely still appreciate it. One Day A Dot begins with, you guessed it: a dot! It soon expands and explodes and begins to mix and merge and create something new. Children will enjoy searching for various “dots” in the illustrations, and they will notice changes and growth prompted by the simple observations and language. Child-like games and ideas help explain complex concepts, and the transition from “Catch the Light” to “Eat or Be Eaten” clearly explains how animals eventually evolved from simpler shapes and beings. Children will notice and wonder at the emergence of teeth and feathers and scales, and eventually fur. Concepts like extinction and a struggle to survive are threaded throughout the book, punctuated by disaster — all appropriately demonstrated for the age group. For example: “When the big dot hit the blue dot…the explosion turned the whole sky red. The whole world was on fire…and all the land-fish burned. But one thing survived.” What seems pretty scary and violent for young children is tempered with the illustrations that show the entire scene, including the one survivor, in one spread. A favorite part of the book is when humanoids appear. After learning about lots of animals that have sharp teeth and claws and lots of warm fur, the book introduces apes and then humans who don’t have those advantages, but do have a big brain to make their own claws and fur. Sensitive children will ask where the fur came from, and they will notice the images of hunters and spears on a cave wall. This affords an opportunity to discuss treatment of animals and different choices made throughout human history. By the end of the book, One Day A Dot circles back to that first dot, and a child’s question about where it came from. There is also a winding age-appropriate timeline, perfect for little fingers to follow, that succinctly follows the events depicted in the book. This book is sure to be a favorite with children and the adults who struggle with their universally difficult questions. One Day A Dot by Ian Lendler and illustrated by Shelli Paroline and Braden Lamb comes out in April, 2018 from First Second. I received an Advance Reader’s Copy for review. Hmm, I will have to look for this book, I think my little guy would like it!